Roadhouse Joe Coffee for sale. Buy online at Zingerman's Mail Order. Gourmet Gifts. Food Gifts. 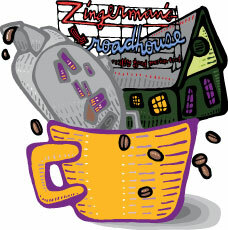 In preparation for the opening of Zingerman’s Roadhouse in 2003, months of collaboration and tasting resulted in the creation of this signature coffee blend. It’s been a hit ever since. Designed to complement food, it emphasizes body and balance over sharpness and acidity. It finishes with a very slight nuttiness and is by far our most popular blend. Technically, it’s a mix of Papua New Guinea, Costa Rican, Indian, and Brazilian Peaberry, each added for their contribution in body, balance and nuttiness. Less technically—but more importantly—it’s a sensible, smooth, crowd-pleasing coffee that’s guaranteed to satisfy anyone at your table (or on your gift list). Tasting Notes: Balanced, slightly nutty. Smooth.